How Do Writers Grow Over Time? Do You Have What it Takes to Be an Elite Plus iWriter? Remember the other day when I told you that I started out exactly where you are as a freelance writer? I definitely wasn’t exaggerating. At the time, I had sold my Italian restaurant, took about six months off and eventually settled on a job with the State of South Carolina. It seemed great on paper. The pay wasn’t that great, but the benefits were phenomenal and I had the exact same 20-year retirement plan that police officers have. So that was my plan- tough it out for 20 years, collect a pension and retire early. Only, that’s not how the real world works. I liked the job itself, but my boss was a complete jerk and there were all kinds of office politics involved. It was miserable there and I kept thinking to myself, “Why am I doing this?” From the stress, our family doctor even had to put me on blood pressure medication. Over time I just stopped feeling like I was enjoying life…and that was about the time I discovered online writing. So when iWriter’s founder and CEO Brad Callen approached me about working for him, the very first thing I did was register on the website to complete a few assignments. Because I had to be sure that iWriter was giving people an incredible opportunity to make serious money. I can tell you firsthand that you can…it is a quality website. But to earn those big paychecks, you first have to prove that you’re the type of professional that can handle a steady client load and always deliver awesome content. That’s the exact same lesson I learned back at the turn of the century; clients want to find specific writers that they can trust and grow with. Because there are a thousand things the average client should know about online marketing that they probably don’t, so they need someone like you who will guide them in the right direction. That’s why iWriter starts people at a basic (standard) level and allows them to advance to higher-paying jobs off of client feedback. You have to prove your worth so customers can trust in you. I won’t lie to you- it took me years as a writer before I was able to average even a decent wage of $25-35 an hour. 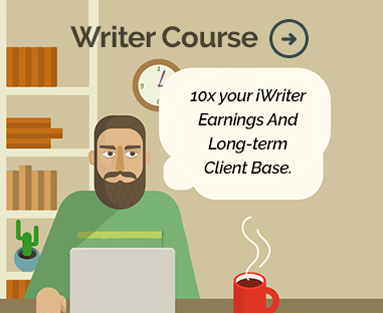 I also got my fair share of horrible clients that made me want to pull my hair out at times, which is why iWriter is basically perfect for someone like you starting out. All you have to do is learn about search optimization, write great content and get paid- the customer service department handles everything else for you. I worked as a freelance writer for about a year and a half before I landed my first really important client. And it wasn’t that this was a job from a big company or for great money; it was simply a web designer who understood how the Internet really worked. In fact, he could make any website appear at the top of the search engines within a matter of days…and every big business in town was knocking at his door trying to hire him. Now, to be completely honest here, this client used a lot of black-hat search optimization tactics that don’t work anymore- but so did everyone else back then. The Internet was like this Wild West of websites where people were making millions of dollars within a matter of months, and the search engines weren’t smart enough to separate the great businesses from the internet marketers. Here’s an important point though; this client’s websites kept growing in popularity while his competitors were disappearing left and right. And we didn’t know it at the time, but the reason he was so successful was because even though he was breaking just about every unwritten rule in the book, he always made sure his clients had amazing website content. One of the first websites I worked on was for a pest control company. My boss had me write around 50 pages of content for this one website, and I prepared articles on everything from spiders to bats to mice and termites. But it wasn’t just filler content- I would actually take my time and research each creature and how to get rid of it, plus I’d list all kinds of interesting facts to help people with pest problems. For example, did you know that almost all scorpions glow in the dark under a black light? To make a long story short, I spent three weeks working on this one website and almost every single one of my articles ranked on the first page of Google for the term “<animal name> + pest control”. And when you searched the actual city where this client was located, he literally held the top twenty-five rankings in a row. All off of my content. To put it simply- I gave a darn and I worked very hard on those articles. But more than that, the web designer I was working for at the time taught me to search the Internet and see what people were looking for when they typed in “pest control”, and then base the content around their most common questions. It was such a simple strategy and we were absolutely DOMINATING with it…all because we bothered to listen to what potential customers had to say. Now, you may think to yourself, “I’m already doing that.” But no you’re not. At least, not as well as you could be. And I can prove it to you. Think of a major household brand that you buy from all the time. It can be a restaurant, a manufacturer, or whatever…that part is not important. Just focus in on one. Next, I want you to write down three questions that you’ve always wondered about that industry. Then I want you to go to that business’s homepage and try to answer all three of your questions in 60 seconds or less. The average website visitor will only search for answers for approximately two seconds on a website before looking somewhere else, so I’m giving you ten times that amount for that experiment. You have 20 seconds per question to find the answers you’re looking for. Just so you know; I’m definitely not a psychic. Yet I already know how you did in our little experiment because large companies just don’t think like consumers these days. They’re too worried about branding and marketing to focus on something so trivial, even though over 88% of the world uses their smartphones to discover businesses in their area to meet specific needs. Like, “How do I find scorpions in my basement?” The answer is to search for them with a black light. That’s exactly why my web design client from 15 years ago had me writing those types of articles, and that’s exactly how you should research every single article you write on iWriter today. You should figure out why the article you’re writing would be important to potential customers and then make sure you give better information than anyone else out there. One last point here – “better information” is a relative term. Sometimes you can do a little homework and come up with an important fact like I did with the scorpions. Other times, you may come up empty. But your article can still be “better” if you write it in a way that’s easy to read and more relevant to customers…which is a topic we will cover in detail later on in chapter six. That’s all I have for you today…we will talk again soon! Although i am taking these lessons so late after they were made available to me , i am learning a lot that i never knew especially in this second lesson. Just have and excited to learn this lessons. They have made me upgrade higher in my skills and have seen the profit of learning. I thoroughly enjoyed your second lesson, Keith. Especially important was the way you searched the net for information for that Pest Control Article. Well, now I have an excellent idea Thanks, Keith. The lessons are good. I like how you go in detail to explain the facts. Am ready learning a lot. I learned a lot from this post it is quite helpful to form my writing. Great piece, really down to detail yet simple and clear. Thanks Miss Koons. I’ve recorded another great achievement with this lesson. Many thanks! This is a very tremendously lucrative masterpiece . It’s very inspirational and educative. Thanks a lot to Mr. Koons for such a great wit. Am gaining a lot.